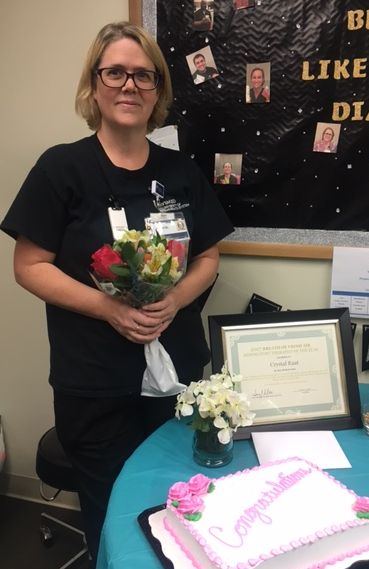 HAYS, Kan. (Nov. 13, 2017) –In celebration of National Respiratory Therapy Week October 22 – 28 HaysMed Respiratory Services awarded their annual Breath of Fresh Air award to Crystal Raat, registered respiratory therapist. The award recognizes a respiratory therapist for their hard work and dedication. The award winner is nominated and chosen by their peers and highlights an Associate who positively contributed the most teamwork and patient care during the year. Raat has been with HaysMed since 2003.